(USED) THIS ITEM HAS BEEN PREVIOUSLY ENJOYED AT MARKETING, CONCERTS AND SPORTING EVENTS. FULLY FUNCTIONAL WITH A FEW SCRATCHES AND SCUFFS. DOES NOT COME WITH PLAY MONEY. MAY REQUIRE A NEW BATTERY. 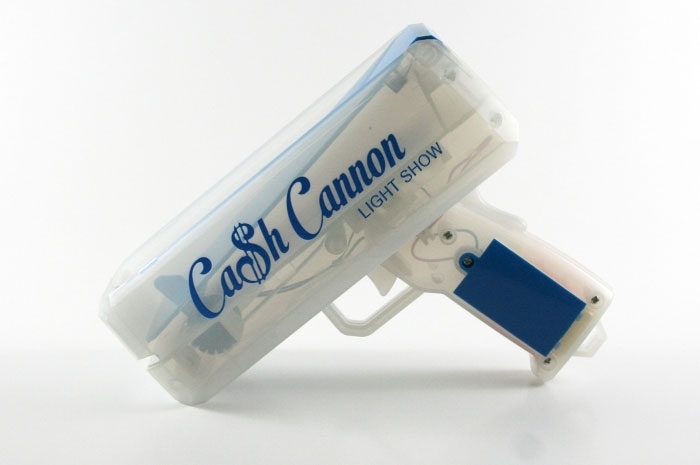 *Make it rain and Light up the Night with The Cash Cannon 2 - Light Show! The Light Show Money Gun is a simple and easy to use device. It can be loaded with US dollar bills or any item that is similar in structure. Made of light weight ABS plastic.